4 wheel laser alignment is otherwise known as tracking. It is a service that sets all of your wheels in the straight ahead position, give or taker a few mm. All cars have a setting they need to be adjusted to in order to maximise fuel performance, improve stability and ensure tyres wear evenly (improving their life). On older cars the only adjustment possible was at the front, known as tracking. On some newer cars the rears are adjustable too. Usually misalignment of the wheels is caused by pot holes, driving up and down curbs, and general wear and tear on suspension or steering components. How do I know when my car needs alignment? There are a few signs your car wheels might need aligning, including (but not limited to) uneven tyre wear, the car pulling left or right, or the steering wheel not being level when driving straight. These indicate that there could be play or wear in your steering/suspension components. Before any alignment we perform a full check of these components. We offer 4 wheel laser alignment for £39 including VAT. 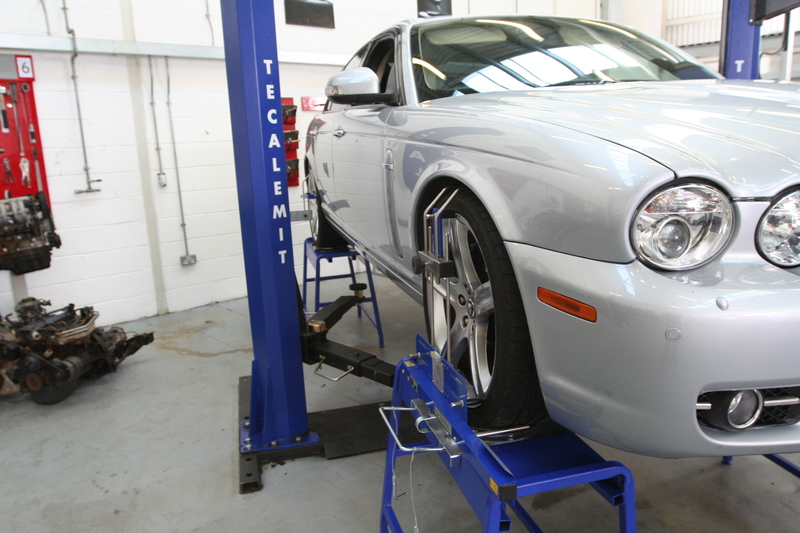 Our alignment service uses specialist equipment from Tecalemit, which is highly accurate and easy to use. It is suitable for car wheel rim sizes from 12″-23″.